Exquisite Antique Mourning Brooch, from the late 1860's to 1880's, of a lovely elegant lady's hand and her lace cuff, holding a berry bouquet, and a Rose Wreath underneath. Mourning pins were worn during the Victorian era to honor and remember someone close to the pin wearer's heart who had passed away. Mourning jewelry was quite the "trend" during the later part of the 1800's, always black. This wonderful pin was likely worn to show sorrow of a loved one's passing, sentimental and so lovely. In the Victorian Language of Flowers, the Berries illustrate sorrow and the Roses love. 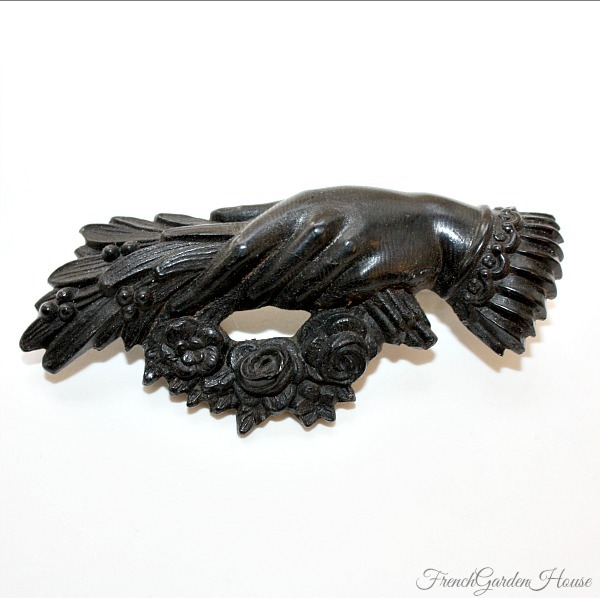 Beautifully detailed, midnight Black, this brooch is a heartwarming way to connect to the Victorian era, or perhaps to remember one you love, it would be a meaningful luxury gift. This has the original pin and c-clasp in perfect working order. Measures a large 3" x 1~1/2".